The Arecibo Legacy Fast ALFA (ALFALFA) survey is an on-going second generation blind extragalactic HI survey exploiting Arecibo's superior sensitivity, angular resolution and digital technology to conduct a census of the local HI universe over a cosmologically significant volume. When complete in 2012, ALFALFA will have detected more than 30,000 extragalactic HI line sources out to z~0.06, and its catalog will be especially useful in synergy with wide area surveys conducted at other wavelengths. ALFALFA is detecting HI masses as low as 106 solar masses and as high as 1010.8 solar masses with positional accuracies typically better than 20 arcsec, allowing immediate identification of the most probable optical counterpart to each HI detection. ALFALFA results already suggest, in agreement with the suggestions of previous, more limited studies, that there does not appear to be a cosmologically significant population of optically dark but HI rich galaxies; fewer than 2% of the extragalactic HI line sources detected by ALFALFA cannot be identified with a feasible optical counterpart. In the region of the Virgo cluster of galaxies, a number of optically dark HI sources have been found. These all lie in the outskirts of the cluster and could be tidal or "harassment" debris, the result of high speed gravitational encounters. Additionally, ALFALFA has identified a intriguing population of massive galaxies with unusually high fractions of their baryons in the form of cool HI gas: how have these galaxies managed to maintain such massive HI disks without converting their gas into stars? At the low mass end, ALFALFA has already detected several hundred galaxies with HI masses less than 108 solar masses and we have identified a class of ultracompact high velocity clouds which match the predictions for gas-bearing Local Group mini-halos. The 2011 ALFALFA sample approaches homogeneity but is not yet a perfectly representative sample of the nearby volume; the full ALFALFA survey, when completed, will be. ALFALFA promises a wealthy dataset for the exploration of many issues in near-field cosmology and galaxy evolution studies, setting the stage for their extension to higher redshifts with the Square Kilometer Array. 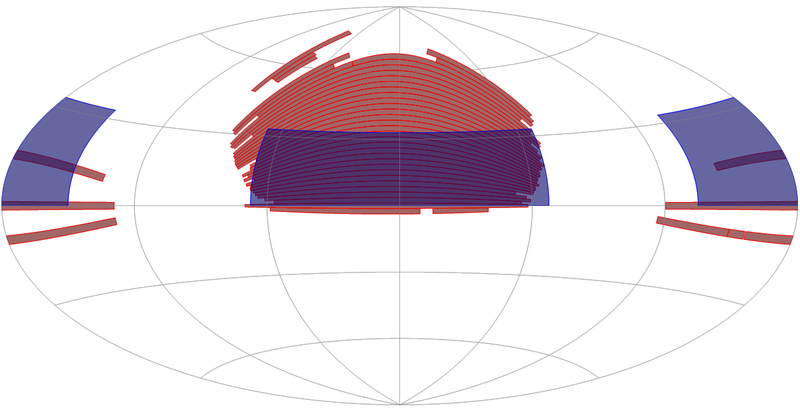 Footprint of ALFALFA (blue) on the Sloan Digital Sky Survey (red). 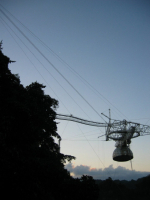 Arecibo is the world's most sensitive radio telescope at L-band (1.4 GHz). In addition to that all-important sensitivity advantage, Arecibo equipped with ALFA offers important and significant improvements in angular and spectral resolution over the previous major wide area extragalactic HI line surveys such as HIPASS and HIJASS. To break ground into new science areas, extragalactic HI surveys with ALFA exploit those capabilities to explore larger volumes with greater sensitivity than have the previous surveys. The lowest mass objects will only be detected nearby; wide areal coverage is the most efficient means of increasing the volume sampled locally. An extragalactic survey covering the high galactic latitude sky visible from Arecibo will produce an extensive database of HI spectra that will be of use to a broad community of investigators, including many interested in the correlative mining of multiwavelength datasets; we thus dub this program the Arecibo Legacy Fast ALFA survey: ALFALFA. A comparison of major blind HI surveys and ALFALFA is presented in Table B.1. A 2-pass drift survey will deliver 1.6 mJy/channel sensitivity (at 18 km/s), 8× better than HIPASS and with 4× better angular resolution (FWHM). In addition to its broad applications, such a wide area HI survey will serve as a strategic approach to a number of focussed E-ALFA science objectives. In coordination with this survey, deeper studies of selected regions, some of which await the second generation E-ALFA spectrometer, will address other critical E-ALFA science goals that are not discussed herein. When completed in 2012, ALFALFA will survey 7000 deg2 and will detect more than 30,000 extragalactic HI sources. It is specifically designed to probe the faint end of the HI mass function (HIMF) in the very local universe and is providing a complete census of HI in the surveyed sky area, making it especially useful in synergy with other wide area surveys such as SDSS, 2MASS, WISE, GALEX, etc. In conjunction with optical studies of comparable volumes, ALFALFA is exploring the "missing satellite problem", the apparent contradiction between the number of low mass halos observed in the Local and surrounding groups with that predicted from numerical simulations. ALFALFA also serves as the basis for studies of the dynamics of galaxies within the Local and nearby superclusters, will allow measurement of the HI diameter function, and will enable a first wide-area blind search for local HI tidal features, HI absorbers at z < 0.06 and OH megamasers in the redshift range 0.16 < z < 0.25. It has already detected, in abundance, some of the very high HI mass galaxies which will be the lampposts for future HI surveys planned for the Square Kilometer Array. On Feb 4th, 2005, we began the ALFALFA program as a 2-pass, 40 sec/beam E-ALFA high galactic latitude drift-scan survey. The ALFALFA observing strategy exploits a simple fixed-azimuth drift scan -- minimum intrusion -- technique, an approach used by others in the past, refined through extensive single pixel test observations in 2003-4 (AO programs A1705, A1763 and A1849) and finally implemented for ALFA in precursor observations in Aug-Sep 2004 (A1946). The 2-pass strategy greatly aids in the rejection of spurious signals and rfi, thus minimizing the need for follow-up confirmation observations, evens out the scallopping in the maps that arises from unequal pixel gain, and offers the opportunity to use the same dataset for the statistical characterization of continuum transients. A wide-area high latitude survey is of interest to the G-ALFA and P-ALFA consortia, and since summer 2005, the ALFALFA observing team has also acquired the observations for the the TOGS ("Turn on the GALFA Spectrometer") survey of hydrogen in the Milky Way. The current WAPP capability is well matched to ALFALFA's goals. Restriction to the 100 MHz from 1335 to 1435 MHz minimizes the vulnerability of the observing program to RFI, particularly severe below 1335 MHz. During the course of our ALFA precursor observations in 2005, we demonstrated through their results (see the A1946 drift precursor page) that the fixed azimuth drift scan technique produces well calibrated, bandpass flattened datasets. We have already invested significant effort in developing software in the IDL environment for data processing and for signal detection. We have established a collaboration with the US Virtual Astronomical Observatory that allows public access to the resultant data products on the shortest possible timescale. Other efforts by members of the ALFALFA team focus on complementary and follow-up multiwavelength observations, on development of velocity flow models, clustering algorithms and numerical simulations, and on the development of educational and public outreach materials. Students at both the graduate and undergraduate level are already involved in conducting the observations and in analyzing survey data and their scientific implications. ALFALFA is on-going but already a number of interesting results have appeared. ALFALFA is detecting HI masses as low as 106 solar masses and as high as 1010.8 solar masses with positional accuracies typically better than 20 arcsec, allowing immediate identification of the most probable optical counterparts to each HI detection. In the region of the Virgo cluster of galaxies, a number of optically dark HI sources have been found. These all lie in the outskirts of the cluster and could be tidal or "harassment" debris, the result of high speed gravitational encounters (Kent et al 2007). Most notably, the object VirgoHI21, suggested by the Cardiff group to be a "dark galaxy", is clearly seen in the far superior ALFALFA map as merely one condensation in a 250 kpc long tail extending from the bright, optically asymmetric spiral NGC 4254 (Haynes et al 2007), which had previously been suggested to be falling into the Virgo cluster for the first time. Based on the ALFALFA catalog available in mid-2007 of some 4500 sources in 15% of the final survey area, we find that only 3% of all extragalactic HI sources and few than 1% of detections with HI masses greater than 109.5 solar masses cannot be identified with a stellar component. First ALFALFA results already suggest, in agreement with previous studies, that there does not appear to be a cosmologically significant population of optically dark but HI rich galaxies. ALFALFA promises a wealthy dataset for the exploration of many issues in near-field cosmology and galaxy evolution studies, setting the stage for their extension to higher redshifts with the Square Kilometer Array (SKA). For more scientific information, please visit our publications page. For an introduction to ALFALFA, specifically designed for undergraduate students, visit our Using ALFA for ALFALFA and Using ALFALFA for Science pages. The ALFALFA team at Cornell is supported by NSF grants AST-0607007 and AST-1107390 and by grants from the Brinson Foundation.